Excellent day! Sure, it involved being in the office for a good portion of it but even that didn't dampen the rest of the day. First of all, the gorgeous weather continues. April in New Orleans is MADE OF AWESOME. (weather-wise) Today it was sunny, dry, and a little breezy. Highs in the 70s-low 80s. 'Course, in a month, it'll be humid to the max plus the addition of swarming termites and stinging caterpillars! But no matter. Went to lunch at Rue 127 today, was craving some roast chicken. And it's so close! I had a leisurely 2 course meal and actually finished my lunch hour in an hour! Anyway, I started with the iceberg wedge salad with bacon lardons, tomato concase, Roaring 40s bleu cheese, croutons, parsley, and herbed buttermilk dressing. Fantastic. Crisp, flavorful, really delicious. Then I had their crazy excellent roast chicken - half a roasted chicken AND a little casserole of mac & cheese AND roasted brussel sprouts. And, apparently, a rosemary dijon jus. So so good. The chicken was cooked beautifully, the skin was crisp, the brussel sprouts balanced the richness of the chicken and the jus... and the mac & cheese was really good, but it was so hot when it was served, that it took me a while to be able to actually eat it, and by the time I did I was already pretty full. As it was, I had to skip dessert, and I really wanted to try their chocolate caramel tart. Good job again, Rue 127! 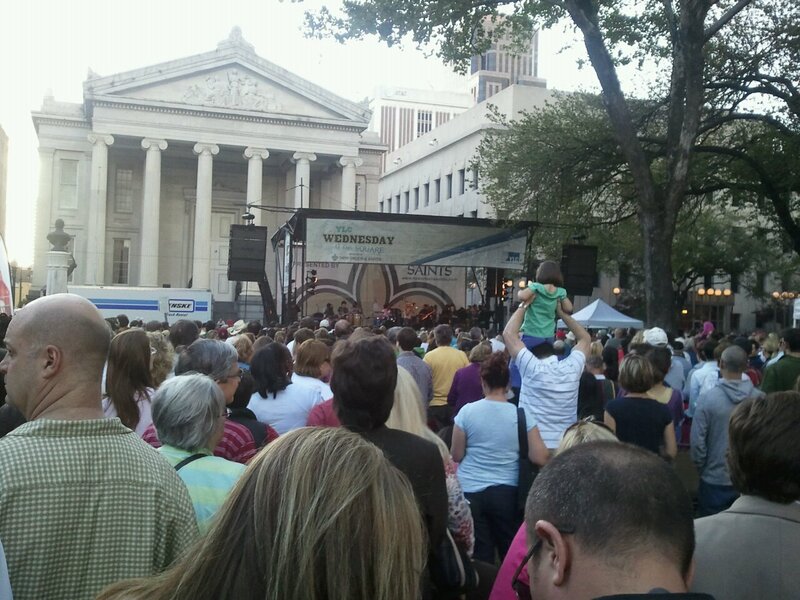 After work, I zipped downtown to see the Wednesday At The Square concert series in Lafayette Square/Park on St. Charles. Parked the car at Tom's office, and walked down Girod till I heard the music. Bought some food/drink tickets, got a beer, got some shrimp & grits (from Achafalaya), got a crawfish enchilada (from Lucy's Retired Surfer Bar), and another beer. For the record, both beers were Abita Jockamo IPA. (You are just going to have to trust me that it's Trombone Shorty up on stage there) It was great- the entire band was really awesome. Tom get held up at work, but he was able to catch a few songs at the end of the set. I'd saved him tickets for a beer, and we listened to the music and danced together a little bit and perhaps smooched a little bit too. Then we went home. 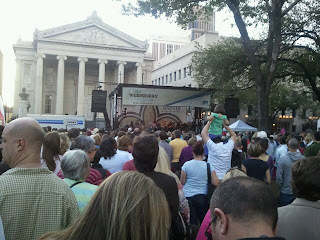 Oh, we saw Kermit Ruffins and Lenny Kravitz on the way out!